The official 1 watt thread. Discussion in 'Marshall Amps' started by Georgiatec, Dec 17, 2013. I did a search of the forum and couldn't find a thread where owners of the 1 watt Marshall amps can discuss their cute little tone monsters and get the best from them. There are threads on the best speakers to use, settings, re-amping them, best tubes to use etc., etc. I just though it would be good to have a place where people can post and reference info without having to search lots of threads for an answer. No doubt a lot of the subjects will have already been discussed in other threads, but don't let that stop you, post up whatever. 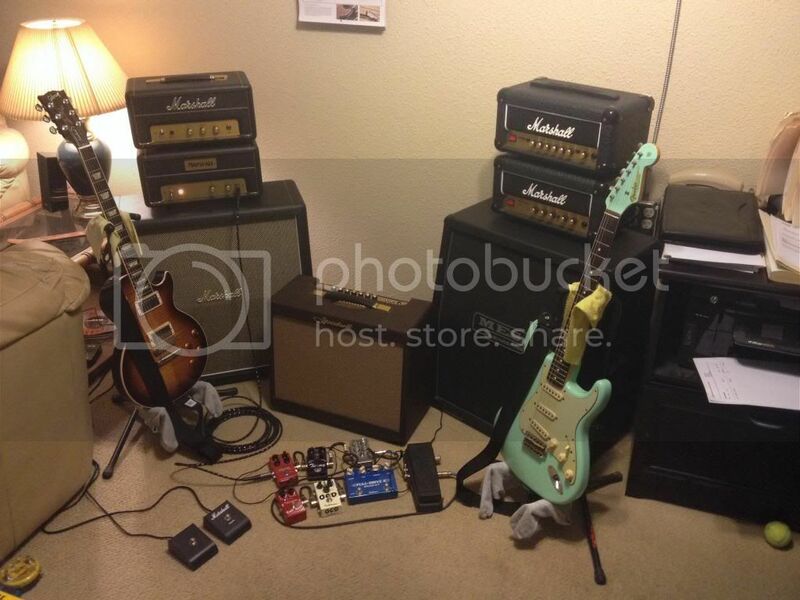 Of course we all like to see photos of the rigs people use their amps with so post 'em up boys (and girls?). I'll get the ball rolling with the single most important tone improvement you can make to a JTM/JCM1 (with the push-pull output ECC82). Put a good, but unbalanced, ECC82 in there. I've actually put a vintage Mullard in my JCM1 today that is so unbalanced it failed on my Orange tube tester....It scored a 14/8. It will fail if the triodes are more than 5 points apart. This, however is still a very strong tube, just unbalanced, which is exactly what you are after. The extra harmonic content in the tone is staggering. I thought the Valvo I swapped out was good, but this Mullard is amazing. I had to just stand there and play for an hour or so. vintmodJCM, Douglas, Steve Naples and 2 others like this. Drivel. Yes and blatant unsubstantiated speculation. At least Marshall released official final production numbers. Maybe this thread can be a mention of previous topics and links to those. Should work for threads on this forum. May work for official marshall info, probably not so well for competing forums. With the push-pull output ECC82, put a good, but unbalanced, ECC82 in there. I've actually put a vintage Mullard in my JCM1 today that is so unbalanced it failed on my Orange tube tester....It scored a 14/8. It will fail if the triodes are more than 5 points apart. This, however is still a very strong tube, just unbalanced, which is exactly what you are after. The extra harmonic content in the tone is staggering. I thought the Valvo I swapped out was good, but this Mullard is amazing. I had to just stand there and play for an hour or so. Yes, I saw that one and another titled "1 watt Marshall's. Both of them started out as "news" threads speculating on the release of the amps. Both were very long winded and full of useless info, with he odd decent post in them. Thought it would be of much more use to have a thread where the info posted is based on experience of owning the amps and how we get the best out of them. This is exactly the kind of info I mean. I would have never found this without the links to the buried thread. I wasn't sure just how the two ECC82's went into the DSL/JVM, but I now know the push pull output is common to all the amps, so the unbalanced ECC82 should be a runner for all of us....apart from the JMP1 that uses two ECC81's. these are a much higher gain tube than an ECC82. Perhaps someone with a JMP1 would like to chime in how it works in that amp and how they get the best results. One thing is for sure, unlike bigger amps the output tube in the 1 watters has A LOT of influence on tone, because they are dimed most of the time. I tried a strong Telefunken in my JCM1, a good strong, but balanced tube. It was ok but made the amp too bright for my tastes. I have been wanting to see some real reviews of the later models the DSL1 and the JVM. There hasn't been much on them. Also some real clips of them too. I am gassing for a DSL1h still but for $500 I could get that ,a DSL5c ,or a slightly used DSL40c or something else. That's my dilemma right now! I want the most for my money but I want a good deal too. Load this post up with video and sound clips then youll really have something! 1 watters in action! JAC and Georgiatec like this. We all know I'm a big fan of the 1-watters. Here is my 1-watt corner. I have added the DSL since i took this picture though. I would say I favor the JTM for its clean and low gain bluesy tones. I would like to hear more from owners who have experimented with speakers. Sometimes I feel like tube rolling is like chasing ghosts. Of course I haven't done any tube changes so I could be missing out. Some comparison clips with before and after tube changes would be cool. eastsidecincy, JAC, briluster and 5 others like this. This is my favorite JTM1 demo. JAC, Douglas, GibsonKramer and 1 other person like this. I love to hook up my JTM1 through my stereo reverb pedal with my Tweed Deluxe clone. When I want a little more raunch, I turn up the JTM...for cleaner sound I turn it down. It's such a pure tone. JAC, Darth Federer, slide222 and 1 other person like this. my JCM goes tru an 80's g12 80 (from the same 4x12 as my other one). For me, in a 1 x 12 cab the G12H 30 (55 htz 444 cone) is hands down the best speaker I have tried with my JCM1. A 75 htz greenback on it's own sounds a little thin, but the 4 Pulsonic coned greenies in my 425a sound awesome...but then any amp sounds great through that cab. I've also tried a 65, 75, 100, V30, G12M, G12C and a G10 20. GibsonKramer, Omegaman, slide222 and 2 others like this. Daddy and daughter rockin'! Whats cool is that you both probably like and relate to that song - dad and daughter. I love it when my kids walk into a room and say to me, "is that Led Zeppelin? That's sounds cool. ", or something like that. That is cool! GibsonKramer and Georgiatec like this. I love my JTM1, but I haven't achieved the great crunchy tones delivered in this vides thru my JTM while playing my Les Paul? The clip sounds great to me...no doubt!! Have others achieved this great crunchy tone with just their JTM1??? Can't wait to hear the LP that's on it's way plugged into it in a few days!!! Namkrad, Omegaman, pedecamp and 1 other person like this. ^^^^ Perfect example of what these amps and some recording and production know how are capable of. I really enjoyed that Minerman. That DSL sounds sweet man.